Location: The Best Western Bistra and Galina Hotel Complex situated in a quiet downtown street will welcome you with a comfortable environment for both business meetings and leisure. 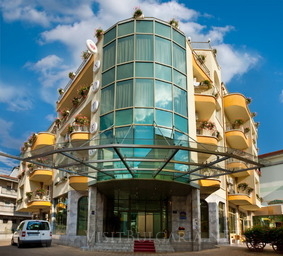 Accommodation: The hotel offers a total number of 38 rooms. Light and refined furnished rooms and studios are distributed on floors for both smokers and non-smokers. Our friendly, multilingual staff will provide you a personalized service and will do its utmost to ensure you have a pleasant stay. Spa & Wellness: Enjoy the new recreation center offering you unforgettable moments in the indoor swimming pool with Jacuzzi®, infrared cabin, steam bath, vertical turbo solarium, fitness center and massage studio. Conference Hall: The modern conference hall with 70 seats, equipped with all necessary facilities will welcome you and your partners for the perfect business presentation and meeting. Wine & Dine: Experience the charm of the National and European cuisine as well as the magic of the fine selection of Bulgarian wines in the luxurious Restaurant Regal and the beautiful summer garden among the flowers and fountain. Our staff looks forward to your visit.